Hello, my name is Robert and I am the Branch Manager for the Easirent Car Hire Cork Airport branch. We have a super range of new vehicles ready for rental including fantastic, economical small hatchbacks to larger family cars that are the perfect choice for exploring Cork and beautiful Ireland. Don’t forget to book on our website for the cheapest prices and I look forward to seeing you very soon! Arriving at Cork Airport by air, when you depart your flight, please collect your luggage and once outside arrivals please telephone +353 (0)21 236 3163 to arrange your shuttle transfer to our site nearby. The collection point is outside arrivals in the middle lane. Arriving at Cork Airport by train the nearest rail station to the airport is Kent Railway Station in Cork City, which is under five miles from the terminal. Connections to all major rail-linked towns and cities in Ireland can be made from Kent Railway Station. Arriving at Cork Airport by bus You will take the 226 bus from Cork Airport, the normal journey time between Cork Airport and Parnell Place Bus Station is 20 minutes. Bus and coaches leave from in front of the terminal building. Dropping off your car at Easirent Car Hire Cork Airport branch you can book in advance for long-term car parking at reasonable rates of around 9-10 euros a day. Both long-stay car parks are within walking distance of the terminal. A courtesy bus service also operates to and from the terminal. For the best experience whilst visiting Cork, be sure to book online with Easirent for your car hire Cork airport best price! The Rebel City, the ‘Real Capital’, no matter what you call it, Cork is one of Ireland’s greatest treasures, a city full of history, culture and pride that has been standing for over 1000 years since being founded by Viking invaders in the early tenth century. A former industrial powerhouse, the Cork of today is a city of international economy and trade, being a base for several major pharmaceutical companies, as well as the European base for tech giants Apple. Cork is also birthplace of Murphy’s Irish Stout ale. Despite being one of the most Southern cities in all of Ireland, Cork shares a similar weather pattern and temperature to the rest of the country, with average low temperatures of around 3˚celsius at their lowest in January, and average high temperatures of around 15˚ Celsius at their highest in July and August. Being a coastal city you can expect rain, and more than its fair share of it, so make sure to pack accordingly when visiting Cork. A mixture of hotels, bed and breakfasts, inns and holiday rentals can be found in the Rebel City, catering to all tastes, budgets and requirements. For a taste of luxury in leafy surroundings, then book a trip at the five star Hayfield Manor Hotel (just 7km away from Easirent Car Hire Cork Airport Branch), one of the most highly regarded hotels in all of Cork. A slice of country elegance in the heart of the city, Hayfield Manor is aptly named as it is a sprawling early 19th century manor, but with all the pomp and luxuries you’d expect from a 21st century five star hotel such as an on-site spa, restaurant, and the Hayfield Manor Wine Society for those who love the grape tipple. Hayfield Manor Hotel is a five-minute drive from Fitzgerald’s Park, just south of the River Lee. If you are only stopping off in Cork for a night or two then you may wish to stay near to Cork Airport. A two-minute drive from the airport itself finds you at the appropriately named Cork Airport Hotel. Modern and quiet, Cork Airport Hotel offers guests free parking and full use of the breakfast buffet, as well as the chance to dine at the on-site restaurant. Cork Airport Hotel is roughly a 20/25-minute drive from the heart Cork. Cork Airport Hotel distance to Easirent Car Rental Cork Airport Branch: 1.8km. If accommodation to you is nothing more than somewhere to store your stuff and lay your head, then consider a stay in one of Cork’s many budget hotels. Commons Inn on New Mallow Road has everything you’d expect from a budget hotel; bar, restaurant and free parking to name a few features, and is roughly a 10/15-minute drive from the heart of Cork. And finally there is the Metropole Hotel just north of the banks of the River Lee. Centralised and friendly, the Metropole has been operating in Cork for many years, and offers free wifi and use of the large accommodating pool for all guests, as well as room service if you’d rather eat in bed than do 40 laps of the pool. The Metropole Hotel distance to Easirent Car Hire Cork Airport Branch: 8.2km. A country built around food and drink and the wonderful experiences that can be had with them, Ireland is a proud culinary nation. Cork is a sterling example of the Emerald Isle’s gastronomic obsession, whether offering up traditional fayre like hearty stews, or showing off all manner of global cuisine that expertly shows off Cork’s status as a metropolitan city. If you are one who adores fine dining and believes that cost is no issue when it comes to a good meal, then book a table at Café Paradiso. One of Cork’s most highly regarded restaurants, Café Paradiso is vegetarian and vegan friendly, as well as being a haven for carnivores. Offering all manner of intricately prepared dishes ranging from Mediterranean to Japanese cuisine, Café Paradiso has been met with international acclaim since opening in 1993. Café Paradiso is right in the centre of Cork, overlooking the banks of the ‘southern fork’ of the River Lee. Café Paradiso distance to Easirent Car Rental Cork Airport Branch: 7.9km. For those with less extravagant budgets and tastes, then a trip to Market Lane should be on your agenda. More wallet friendly than Café Paradiso but by no means cheap rubbish, Market Lane serves a host of Irish and European favourites, from soups to steak and ale pie to monkfish and everything in between. Market Lane is a 10-minute drive from the centre of Cork, just East of the English Market. Cork isn’t just known for great food though with whiskey drinkers in particular aware of Cork’s important place in Ireland’s storied history of alcohol production. Home to the Jameson whiskey distillery, visitors can take a guided tour of the old distillery and see kilns, barrels and mills that were used in the whiskey making process. The tour also gives guests the chance to partake in a free sample, with some guests chosen to take part in a taste comparison, so make sure that there is a designated driver in your party. The Jameson Experience is a 30-minute drive from our [ORK] Car Rental Branch to the location at North-West of Cork city in neighbouring Midleton. To some, the be all and end all of a good trip away is measured by how good the shopping is. If this sounds like you then you’re in luck, as Cork boasts all manner of shopping experiences no matter your wants, needs, or budget. Merchant’s Quay shopping centre is everything you’d expect from a city centre shopping complex – home to clothing, cafes and department stores. Merchant’s Quay houses Debenhams and Marks & Spencer, as well as Boots, Laura Ashley, and other well known high street chains, and is situated on the River Lee, in between the two ‘forks’ of the river. (Merchant’s Quay distance to Easirent Car Rental Cork Airport Branch: 7.km – but subject to traffic congestion on weekends). If you’re willing to drive a little further out of the city, then Mahon Point shopping centre is a 20-minute drive away from Cork city in neighbouring Mahon. Mahon Point boasts over 50 shops and over 2000 free parking spaces, and features the likes of Next and Lacoste, as well as anchor tenants Debenhams and Tesco. Mahon Point is the largest shopping centre outside of Dublin, and also houses a multiplex cinema and a host of bars and eateries when you’re done shopping. If you’re after something a little more exciting and an experience which is quintessentially Cork, then pay a visit to the English Market in the heart of town. One of the oldest municipal markets in the World, the English Market has been serving the people of Cork since 1788 and to this day still offers all manner of wonderful fresh produce as well as novelty items, clothing and gifts. The English Market is in the very heart of Cork, and is roughly a five-minute drive from the legendary Queens Old Castle. There’s also Mother Jones Flea Market, a 15-minute drive north of the city centre, a veritable treasure trove of vintage pieces, oddities, curios, and hand-crafted bits and bobs. Admittedly a bit of a tourist trap, Mother Jones Flea market (a 20 minute drive from our local Cork Airport Car Rental office) is still worth a rummage and wander around even if you’re not planning on buying anything. The Rebel City has been standing in some shape or form for over 1000 years, and Corkonians (the preferred term for the people of Cork) are very proud and enthusiastic about documenting and sharing their wonderful city’s past. A worthwhile visit, especially if you have younger members of your party in tow, is the Cork City Gaol. This 19th century former jail now offers a look back at crime and punishment in 1800s Cork, where visitors can walk around the grounds and cells, and even be placed in the stocks! The Gaol itself is a beautifully preserved building sat upon lush green grounds and is a 6-minute drive from the city centre, located near the Ard Sionnach district. Cork City Gaol distance to Easirent Car Hire Cork Airport Branch: 10.1km. For the best of Cork’s history though you owe it to yourself to take a trip to nearby Spike Island. Located just East of nearby Ringaskiddy (a 30-minute drive South-East of Cork City) Spike Island was announced as Europe’s Leading Tourist Attraction at the World Travel Awards 2017. Here you can visit the monastery and fortress (yes, fortress!) which became the largest prison in the world in the 1850s. It is highly advisable to book ahead as with your car hire cork aiport booking, as you will have to plan accordingly for transportation to the island, as well as check visiting times as these change season by season. Back in Cork, there is also the CIT Blackrock Castle Observatory, a 20-minute drive East of the city. Originally constructed in the late 1500s as a coastal defence fortification, Blackrock Castle was converted into an observatory in 2002. Visitors can take a guided tour of the castle and on selected evenings in the year can also attend evening/night time talks about outer space and the work of the observatory. Plan ahead of your trip to see when these events occur, especially if you are fascinated by castles, outer space, or the unlikely combination of the two. And when everything is said and done, there’s always the Butter Museum. A 5-minute drive North of the city centre, visitors have the opportunity to take a closer look at the history of butter and what makes real Irish butter that much better than all other kinds of the delicious yellow dairy wonder. The team at Easirent Car Hire Cork Airport wish you a wonderful stay in Cork. 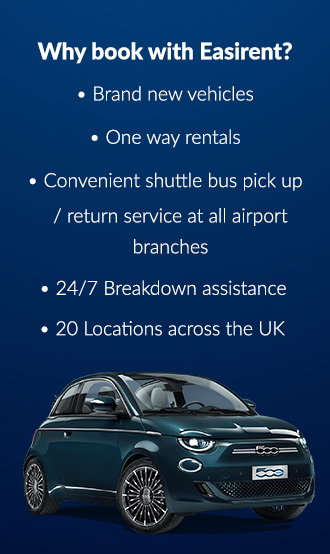 Our office is situated close to the airport and if you require car rental services then please get in touch or order directly at Easirent.com where we have a big selection of hire vehicles at competitive prices.